Hi got everything installed ., But when i start Gnu radio all iam getting is all 00000000000000000. Its saying SET DC, OFFSET !!. What do i have to set this too ? And where ? Would apreciate some help after getting this far thanks …..
Well thanks to the instructions of you guys i finaly got this going after hours of trying . But its a pitty some is encrypted … Still searching new frequencies .Thanks to HOAGY. and enCrypt . As promised here is a step by step guide for those that might still be having problems. Please also note, I’m not responsible for any damage you may do or data loss you may suffer on your system by following my instructions! From a terminal window do a “apt-get update” and an “apt-get upgrade” and let these install all available updates. NOTE: You get ‘libncurses5-dev’ not ‘libncurses-dev’ but this doesnt matter. Leave the terminal window open as we’ll need this again shortly. In the search box at top left search for ‘gnuradio’ and tick everything to do with gnu radio or gnu radio dev. Hit Apply then hit Continue to agree to download extra supporting packages. Click Close when Kali offers to run any new applications. In the search box now type SDR and install anything that mentions SDR or software defined radio, rtlsdr or RTL2832U, click Apply. Again click Continue to agree to any extra packages needed. This should give you one item, tick this, Apply and Continue as above. Close Add / Remove programs and move onto the “Install libosmocore-sq5bpf” section of the main instructions above from your terminal window. Hopefully these commands will all run ok. If that doesn’t help, I’m afraid I’m the wrong man to ask! Now move onto the “Install osmo-tetra-sq5bpf” section of the main instructions above. If all has gone well, that should be it for installing and compiling everything! Its a good idea to take a reboot of your VM here. Once the VM has come back up, plug in your SDR of choice here. Careful that your host operating system doesn’t try and claim it. If it does, eject it and the VM should then pick it up (if you enabled USB in the settings!) In my VM settings I also had to go into USB, USB Device Filters, click Add, then add my RTL stick here, and OK.
You’ll know when its connected to the VM by right clicking the little USB plug icon at the bottom right of the VM window and it should be ticked. You may also see a blinking red activity light here too. NOTE: Kali seems to have its sound muted by default on every reboot, make sure its un-muted up on the top right. This should all be self explanatory and hopefully you’ll be in business. My next step is to experiment with copying / cloning my VM from my Desktop PC (where I built it) to my Laptop PC so I can use it mobile. Thanks to the authors of the main instructions and to all those who helped me get this working. My instructions are a mish mash of all of them. Hope this helps those that are struggling. I’m guessing this may be something to do with my laptop spec not being man enough for the job maybe as its exactly the same VM just running on a different host…. Quick update, I’m now using the same Kali VM but in VMPlayer rather than VirtualBox and its SOOOO much better! The ./rxx window is now scrolling valid data ALL the time rather than giving the burst errors and some data sometimes and I have audio all the way through the transmission now rather than just a quick burst at the start. Although Air Encryption says its ON most of the time, I’m getting a lot of unencrypted voice so I’m happy! I think You forgot to write this step in Your tutorial. I did everyting as You wrote, but it did’t work. then I found in comments HOAGY post, and after those two command lines everything starts to work. This will install additional dependencies for airprobe. You also might do an new apt-get update & apt-get upgrade. Only after this proceed with installing the TETRA soft. Hello , Ive installed everything and all seems to be ok other than ive a got a problem codec-patch file . Ive downloaded it , And copy-pasted it to etsi codec-patches , but when i go to locate and unzip the file its telling me CANNOT FIND or UNZIP file . Ive got this far and would realy apreciate if you or anyone could help me . …. many thanks . ok,did you download an unzipper or via command line. I did it with Archive manager, which you can find in Applications==>System tools==>Add/Remove software. Think I had the same problems. I did it viar command line … . you might try with Archive manager as ren you can choose the file you want to unzip. Ok thank you i will give it a try …. Please note that the codec zip file is NOT the same name as it says in the instructions above, it is a much longer name. I noticed that too so when you go to unzip it in the cmdline do an ls first to find what the name is then after the unzip -L put the first few letters of the (different) name in and press tab. This should complete the name for you. Apologies if you’ve already know this etc…. thanks for remembering this :-). The unzipped file is named etsi_codec-patches and I have it in osmo-tetra-sq5bpf folder. Hi Hoagy … Thanks for the info i now have a list of the codes. getting there slowly but sure . I’ve now tried this on fresh installs of Ubuntu 14.04 (same as this article used) and 14.10, Debian 7.6 and Mint 17 (all 32 bit versions) running as VirtualBox VMs with 2 CPUs, 1GB RAM and 20GB disk space. I’ve tried running a “sudo apt-get update” and “sudo apt-get upgrade” first and also WITHOUT doing this first. I’ve tried changing to different main repositories on each OS. Has anyone successfully set all of this up in the last few days please? If so, exactly what OS and what version did you use? Was it a VM or a physical machine? Did you see the same error with “libzmq1-dev” yet it built successfully? Am I maybe using OS versions that are too new? All same here. I think that script installs GNU Radio 3.7 somehow. Could that be our problem? Did you use the -o flag with Marcus’ script, or is it broken now? If you install from repositories you’re probably going to get 3.7. Check your ver with gnuradio-companion –version. 3.7 in my case but maybe I screw it somehow with updates. Can I try to install GNU Radio 3.6 from tar.gz manually and later osmo tools too? will it work with telive without any additional tweaks? well I installed the software “osmo-tetra-sq5bpf” 3 month ago and couldn’t get a result. Tried Ubuntu did not work, as U always get GNU 3.7, downgrading to 3.6 unsuccessfull. So I’ve installed a new SSD HD on my system, 64bit 7core. Then I installed Kali linux32bit version and afterwards the Tetradecoder soft. When doing apt-get update, apt-get upgrade = ok…………”never do apt-get dist upgrade”….this will upgrade to GNU to 3.7!!! I got no problems during install and the software runs fine. Are there any 2TB HD for a good price??? … HOAGY … any luck with that?? Well VM stands for Virtual Machine, tried this first under WIN8.1 but your PC needs to be fast. But as I mentioned in my other post I installed a second SSD on my machine and it works fine, so this is a physical machine. So when running either WIN8.1 or Kali Linux, I need to switch in BIOS WIN or WIN7/OTHER and so I can switch systems. @enCript, sorry read it the wrong way. Thanks all for your valued input. I’ll let it run again (and fail no doubt) then see what version of Gnu radio I have. your welcome. I’m not a programmer just a user, worked for over 20 yrs in radiocommunications. https://www.kali.org/downloads/ and download 32 bit version. Either you install it alongside your actual system or on separate disk. Then do apt-get update & apt-get upgrade. Next you have to download the modules for wireless attacks i.e. 2.SDR and a few more just don’t remember now. All modules can be found in top Menu==>Applications==>System tools==>Add/Remove software. Then type in upper filed i.e GNU and choose modules. Same for SDR. Kali used to come all in one but because of size matter actually with minimum programs RFU. But it’s easy to download and the system also downloads additional software when needed, just asks if you agree. After all this run the TETRA install. If you have Ubuntu alongside or primary system, then first install Kali and then Ubuntu. Ubuntu recognizes the Kali installation and at boottime offers you to select either Kali or Ubuntu and you don’t need to do this BIOS thing. You can conveniently select in the Menu after system boot. Thanks for this, I now have a Kali machine built. On your step 1 GNU, do I just accept the default modules that are ticked here? Do I need to choose all the GNU Radio related ones, or does that get installed later? Well, thanks to Hoagy’s suggestions, I finally have this running! FINALLY! Re my last questions, I went with my gut and just installed what I though was needed into Kali. I’m not getting ANY audio at all which I thought I would even with Air Encrypted stuff, is that correct?? I have this all running in a Virtual Box VM built with Kali. I wrote down every step I took to get it running and I’ll detail that here later / in a few days to help others that might still be stuck. I may even be able to provide the prebuilt VirtualBox image for others, I’ll look into that. Its certainly going to make things easier for transferring the system onto my laptop for portable work. I’ve forgotten to tell you to check this. And I get very short, first syllable sounds with Telive on any speech transmissions then it stops. The network I’m listening to is Air Encrypted though so maybe thats normal? I have not found any unencrypted networks as yet. but during the whole transmission. So let’s go to the next step 🙂 decoding !!!!!! sorry wasn’t on my PC yesterday. But I think you did it the right way. Yes when the system suggest’s other files you can do it. I don’t jnow if you knew Kali before, but there are so many other features you can chose within. But you should be able to hear a scrambled signal when your software is running! or at least see some indications in the Telive window like i.e. ok or so. When having unscrambled or unenCryted Tetra works fine. Here in my area I’m lucky, I have a commercial Tetra Network which has clear and encryted (basic) signals. Police recently launched a Tetra Network with 256bit AES encryption :-(. Sorry again for the delay in answering but think we have a bit of time shift between u and me :-). So I guess something in the script is no longer working. Maybe I’ll try Kali next…. The “blks2” and “optfir” modules seem to be missing (if I comment out “blks2”, the same error for “optfir” pops out). No such directories are in my /usr/local/lib/python2.6/dist-packages/ (not sure if that is where they should be). Could I somehow managed to install another version of gnuradio, even if I proceeded strictly according to the manual? Have anyone also accountered this error? Please help. Same here on a fresh installed Ubuntu system. Is the install script still valid? Anyone figured out a different way of doing it? Same here with addition of typo issue “libzmq1-dev” i solved. Can I decode TETRA signals from wav file by using this software? This thing does not work at all. Libs that does not exist, compilation fails, a lot of dependencies. Is there a boundle that actually works? you could try running this in your terminal sudo apt-get install autoconf automake libtool libcppunit-dev python-dev libboost-all-dev [note the automake] and and then the script i think the script started building gnu radio blocks after this, not sure. gnu 3.6 shareing the same operating system with 3.7 is not a good idea they could conflict. Found out that the autoreconf is part of automaker which it spawns. Automaker 1.14 is pre-insrtalled as standard for ubuntu 10.04 trusty tar, well on the 32bit this version will only accept top directory not the sub -directories where the objects are built, the standard method is to edit the scipts in automaker to accept sub directories with something like AM_INIT build = subdirectoys orvsomething to the errored maker.am file somewhere in top of the file. compiling look cheap but it worked for me. for the older vrtsion and a big thank you for the software i works fine includeing audio and telive data, but i might try wireshark on udp as well, this has been a decent challenge which to solved out, amateur radio slow-scan tv will be my next challenge. IS IT POSSIBLE TO INSTAL GNU RADIO VERSION 3.6 AND 3.7 IN SINGLE OS? Is it possible to install GNU Radio 3.6 version and 3.7 in single OS? Finally got gnu 3.6 installed, thank you marcus leach,this is the output from compiling libosmocore-sq5bpf$ with autoreconf -i.
I’m no programmer but does this have something to do with zeros seen during operation in the companion window and no data. Hi have installed osmo tetra before and decoded tetra payloads on kali linux. the marcus leach gnuradio 3.6 script has taken a staggering 5hrs 46 minutes its faster than speeding snail on the previous install attempt on this ubuntu. 14.04.Also i compiled and installed this program without error on a 64bit machine carried out same instructions for tuneing as well as ppm, gain ect same thing no data displayed. Will continue to see if this program works at all. If you have a valid signal, you should at least see repeating data like the ‘Air encryption’ information in the terminal window, even if there is no voice on that channel. Try to ‘scan’ through the TETRA frequencies in steps of 25kHz, maybe you find another stronger signal. You should see a clear difference between the level of noise and the level of a TETRA signal. The fine-tuning of the signal can be done with the naked eye: The 25kHz TETRA signal has to be placed symmetrical in the middle of the graph. And be sure that your dongle is connected to your virtual machine and the drivers are working. Because if not, GNUradio will simulate an input device and will run anyway. well, I am well seasoned in Linux and I was not able to make it work. Could you share your virtual machine file? It is working fine (even without having good Linux knowledge). Is there a possibility to change the GRC Flow graph to display the FFT or a waterfall of a wider spectrum to search for TETRA signals ? Or can SW like GQRX be run in parallel ? Just solved my problem: By loading telive_1ch_simple.grc there will be another FFT with wider spectrum which can be clicked to search for signals. Please feel free to link to or embed the video in the article, using the embed code provided by youtube. Can you tell me the computer / VM specs you are using to acomplish this. I’m trying to run this as a VM on a intel i5 laptop but this gives me bat audio (no i’m not listening to an encrypted signal). At the moment i’m Just using a single channel, not dual channel. Error trying to install with ubuntu 14.10 fresh install just for it. I there another manual for install th software? John try to read the original telive docs, not just the tutorial. I’m having a problem when I run “patch -p1 -N -E < codec.diff"
to unzip Tetra codecs. The “-L” parameters makes all extracted filenames lowercase which is what the patching diff script expects. If you use GUI or omit the “-L” parameter, extracted filenames will be uppercase and the script will ignore them. use “autoreconf -i” instead of “autoconf” command. You’ll also need to “sudo apt-get install libc6-dev-i386” if you’re using a 64-bit machine. Warning: Block key “variable_cc_decoder_def” not found When loading category tree. Warning: Block key “variable_repetition_decoder_def” not found When loading category tree. Warning: Block key “variable_dummy_decoder_def” not found When loading category tree. Warning: Block key “variable_cc_encoder_def” not found When loading category tree. Warning: Block key “variable_ccsds_encoder_def” not found When loading category tree. Warning: Block key “variable_repetition_encoder_def” not found When loading category tree. Warning: Block key “variable_dummy_encoder_def” not found When loading category tree. Warning: Block key “fec_bercurve_generator” not found When loading category tree. Warning: Block key “qtgui_freq_sink_x” not found When loading category tree. Warning: Block key “qtgui_const_sink_x” not found When loading category tree. Warning: Block key “qtgui_waterfall_sink_x” not found When loading category tree. Warning: Block key “qtgui_time_raster_sink_x” not found When loading category tree. Warning: Block key “qtgui_bercurve_sink” not found When loading category tree. Warning: Block key “qtgui_histogram_sink_x” not found When loading category tree. Warning: Block key “qtgui_number_sink” not found When loading category tree. Warning: Block key “qtgui_vector_sink_f” not found When loading category tree. Can I use “apt-get install gnuradio” on Ubuntu and install the latest one? Will that be compatible with TETRA? If not I will better download Ubuntu 32bit like you said in your article and hope atleast then all goes fine. I am having Ubuntu 64bit and I am having hard time to even make it work. Unable to make ./receiver1 1 work. It is telling Gnuradio is unknown (which I doubt is some path error with Python and I am not able to correct it), For others who get stuck around 11th step “make” you have to Install libx32gcc development package and 32 bit GNU C Library. apt-get might install GNU Radio 3.7 on newer Ubuntu distros. For this you don’t want the newest version, you want GNU Radio 3.6. Better to use the script. Thanks Admin. I used the script but with my limited Linux knowledge it was impossible for me to make it work. Then downloaded 32bit Ubuntu 14.04 and followed your tutorial and I was able to install it. Could you also make a tutorial of how to use the Telive software? Without a detailed tutorial above I won’t have reached this far. Thank you very much for your effort in making such a detailed step by step tutorial. Now managed to record few .ogg files but all giving grrr sound and file sizes are very small. Lot of files with 2.5kb and some are little bigger like 20kb but all contains grrr sound only. Live audio from the Telive is also grabled. Something went wrong with my codecs? On Mint also the problem continues. But for newbie like me who want to install here are few tips. After that continue with this excellent tutorial. Is it possible to use the program using a soundcard connected to a discriminator connection from a scanner? I did get the audiosource in the cicuit. Fft displays comes, but after a few seconds it hangs. Maybe i need to do more. What changes in GNU Radio need to do something, instead RTL-SDR could be connected usrp B210? I had that warning as well, but it’s not an error and it seemed to cause no problems. Ok, found out that aplay was included in alsa-utils that is already installed. Im getting the error “FATAL:Failed to open rtlsdr device” when i execute the flowgraph in gnuradio-companion. 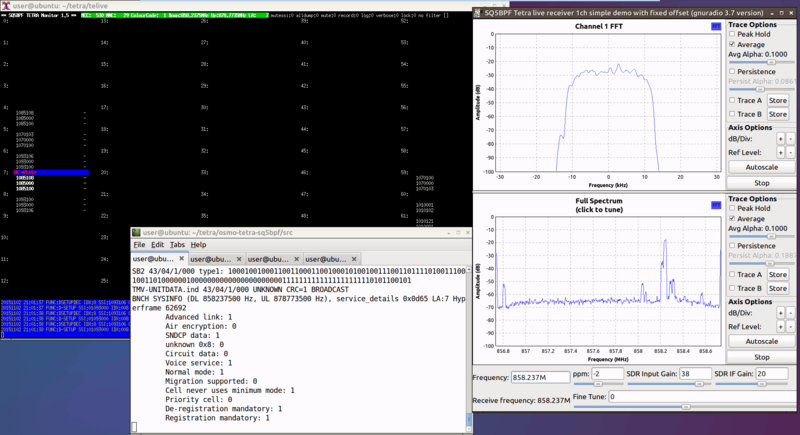 I see the signal in FFT window, but no traffic in the terminal window where i ran ./receiver1 1. 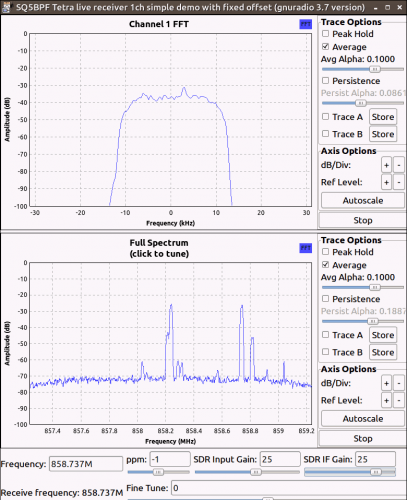 Check to see if your RTL-SDR is functioning correctly in Linux with rtl_test first. The DVB-T driver is currently loaded on your system. Use “sudo rmmod dvb_usb_rtl28xxu” to unload it, or blacklist dvb_usb_rtl28xxu in the modprobe.d folder for a more permanent solution. Ubuntu 14.04.1 32bit is unable to locate the “aplay” package. Sorry I have fixed that typo now. When I installed it install.sh wouldn’t create the bin folder and gave errors without it. The new version probably fixed this now. Thanks, just wrote the tutorial yesterday and the software is already updated! New version seems to be working well too.